I can’t properly describe my excitement at finally having a true Dark Sun home campaign again. My last one ended somewhere in early 1994, so it has been a long time coming. I am blessed with some excellent players, so the task of building a compelling campaign is much easier. Nonetheless, I want to share thoughts on how I am setting up the campaign (without spoiling things for the players, some of whom may read this). The campaign is called Crown of Sorrow (and you can use that tag to find other posts about this campaign). 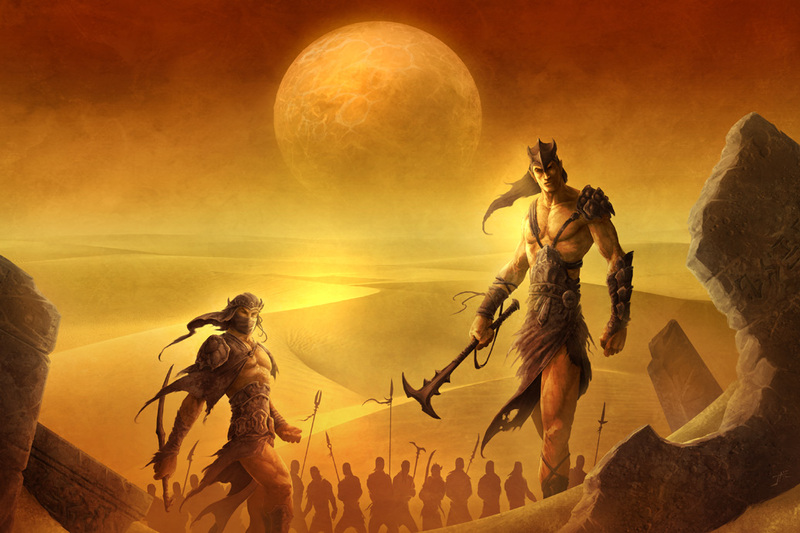 In my last Dark Sun blog I wrote about choosing a campaign and suggested some campaign types (such as a Free Tyr campaign or merchant house campaign). Because I have a good amount of experience with the setting, I chose a different starting point and I will be mixing in some of those themes in over time. 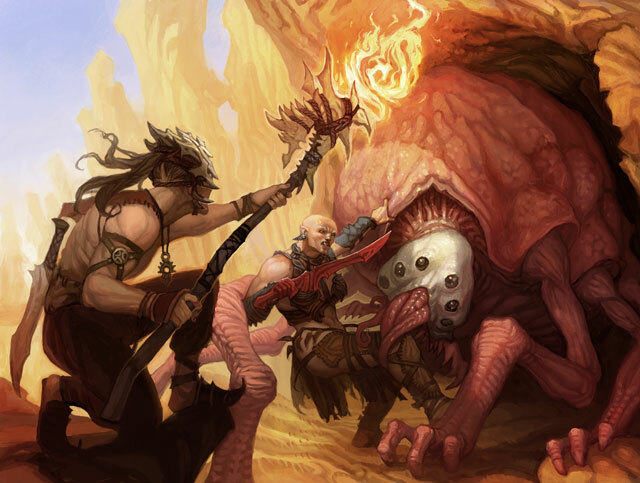 Additionally, there has been a lot of talk this year about the concept of Sandboxing, where players have full control to choose their path, versus the more traditional “railroading” or driven style of DMing where the DM presents the story in an ordered fashion. Finally, there has recently been a lot of discussion about Dungeon Design, which in turn leads to a larger discussion about 4E and how the wonderfully engaging combat mechanics can overshadow and undercut the excellent role-playing that should take place. With this campaign I want to tackle all of those issues. I want a really compelling story experience for the players that gives them ownership in how the story unfolds and that will create truly memorable role-playing experiences. How do we do that? I will cover this across various blog entries, starting with this one. The first thing I like to do is just come up with ideas. There are many ways to approach this stage, and it often happens in tandem with deciding on the type of the campaign we will run (as described in my last DS blog). Anything can happen here, from ideas about NPCs, types of battles, types of creatures, story components, locations we like, etc. My personal approach is to just think about the campaign a lot and when something sounds worthy I jot it down. Some DMs/authors use a notebook specifically for the adventure. I use the backs of old printouts (I take personal delight in reusing some of my old AD&D Dark Sun netbook stuff that no longer fits in 4E!). As I dream and scheme I jot down ideas. Every now and then I bring it all into one giant word processing file (Word, Open Office, whatever) on my computer. Here I give it some organization, and even an index. I tend to organize things into general campaign ideas and then just place the ideas in the order I think they might come up. I might place some ideas on Urik up front if I think I will start there, for example. I usually keep a separate file for NPCs and another for things related to PCs. The important part is just to train your brain to constantly think up good ideas and to have some system by which you file the best thoughts away. Reading the Campaign Setting book, Creature Catalog, WotC forums… all great times to keep pencil and paper handy. Here I will make an assumption. We want a campaign that feels like a novel or movie (or a series of either) instead of a series of missions/explorations. We may want to start simple, give hints of something larger, develop the setting aspects for the story (NPC allies and foes, locations, etc. ), develop the threats, reveal some surprises, have some initial conflicts, reveal more, have some successes and setbacks, reveal the big threat, and end with some fantastic battles that the players really care about. For that kind of story-rich campaign we want a clear sense of the story. It is natural to think about aspects, like threats, and I like to file those away in my ideal file until they solidify. Instead, here I like to work with a broad brush to paint the campaign’s development. By the very nature of this exercise, we have to make choices. It forces us to decide as DMs and authors what will be best for the players. For example, we may be working with a Gladiator campaign. We may want PCs to start with a sense of losing everything and become enslaved. They become gladiators. They can prove themselves, gaining glory and recognition. They might be hired out by various parties, giving the campaign some variety. Maybe over time a foe is revealed, and that can run in parallel with their gladiatorial efforts. The foe might be a front for an even bigger foe, and the end of the campaign is about tackling that foe, perhaps with implication of change (for them, for the city, for Athas). Storyboarding really kicks in when we start mapping out how the story will play out. My storyboarding technique is a simple written version of that employed by movie, comic, and video game companies. They are dealing with visual organization, but the key idea is to experiment with the organization of the story and to get a sense of how the parts will fit together. Importantly, it is also an idea generator. I place my ideas on discrete entities (boxed sections on a large piece of paper or chalkboard, index cards, etc.). In each “board” I write down what might be seen as a chapter in the story. This might be a single gaming session or it might be a couple. Something like the attack on the caravan is one. A trek through the wastes is another. 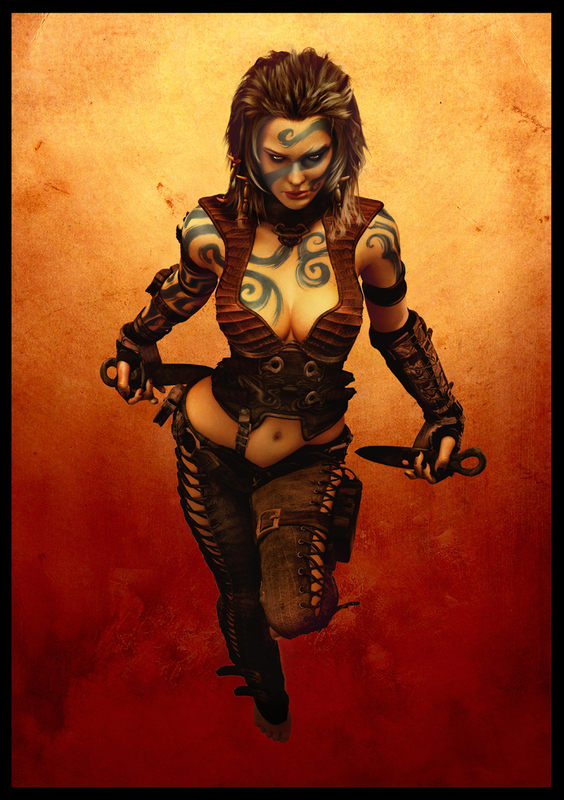 Gladiatorial combat in Urik could be one box despite consisting of three matches/encounters. Each story chapter gets a few notes. Enough for me to know what it is about, plus room to jot down ideas (this process often provides inspiration). If using index cards, I would have a title in big letters and then 1-3 lines describing what happens. Now I arrange the “boards” in order. Many of these cards don’t start with an order, because they come from the idea file. I might have an idea of a series of missions where a merchant company hires the gladiators for some task. I might also have the concept of a desert trek and a certain monster. As we plunk down the cards we note how the story feels and we make changes. We might try three different spots for the “merchant hiring” series before it fits well. We might suddenly see where the desert trek fits. We might notice that one index card we thought was wonderful now seems out of place and needs to be replaced. During the process we look for story connections. We want to find ways that each card really feels like it connects. For example, we might jot down at the end of one gladiatorial combat card “rich merchant sponsor becomes a fan, calls them forth to congratulate them, private dinner” as a way to segue to the merchant hiring series. It is critical that the overall story feel good. We want each step to contribute towards the campaign’s concept. At the end of this process, we want to be able to summarize our campaign in no more than a few sentences and feel great about it! By the nature of this process we also think up a lot of more detailed ideas which can go in our idea file. For example, we might see how that first card, the attack on the caravan, could fail. No one wants to start a campaign as a player by failing. So, in our idea file we might jot down that the PCs should know from the start the forces are overwhelming. However, they see things they can do. Maybe they befriend a young NPC boy during the ride, and they can choose to distract the attackers and get him out. Now this can be an NPC that works from the outside to free them… maybe he is even the son of someone important and that can end up affecting the story! We might also be able to provide some bigger dynamic options. Maybe the PCs can force the attack to be harder than the slavers expected, such that they negotiate for the PCs and spare the others? We start scheming how this first session can be about loss, but also have accomplishments – a hint of things to come. I need to repeat this one more time. At the end of this process, we want to be able to summarize our campaign in no more than a few sentences and feel great about it! We also want to feel really good about the number of gaming sessions and have good ideas on the encounters in each one. The technique of story arcs is based on the idea of linking episodes together. This is done often in TV, where the goal is to make weekly episodes feel like there is a larger story in play and that the setting of the show is realistic and complex. This also works with D&D, because each gaming session is a discrete episode but our story plays much better if every episode feels like part of a larger whole. Additionally, a good story often has a bit of complexity. Story arcs are a good way to have complexity and to introduce change. Most dungeon crawls are very linear. Go into the dungeon, defeat adversaries, and recover the artifact. We can easily add some story arcs to make things more interesting. For example, on level 2 the PCs might find some captives. One of them becomes a nemesis to the party. The story of why they were there, how they react to the PCs, what they do, and how the PCs finally triumph is a story arc that makes this level of the dungeon much more interesting. As a classic example, consider any movie and how story arcs help develop the main characters (Luke and Leia and Han, Aragorn and his birthright, etc.). On Athas, we might have a story arc around the boy or other members of the caravan. We might have a story arc about one of the gladiators the PCs meet, a thri-kreen that is near desperation without a clutch. We might have a story arc about how merchants and nobles interact (which plays out when a rich merchant hires them). Ideally, try to have these stories be flexible and even revolve around the PCs so the players will feel a part of them. (More on this later). As we storyboard, we want to be on the lookout for new ideas. Story arcs are great opportunities for us to expand the scope of the adventure. That gladiatorial campaign can delve into “Free Tyr” and VA campaign aspects when the gladiators meet a captured VA spy forced to fight to the death. If they find how to spare them (perhaps through training, perhaps a deal with the arena manager, etc. ), it opens up opportunities to serve the VA and strike out against those that threaten a free Tyr. We can mark story arcs on the storyboard cards by adding in colored pencil/ink a note about how the story arc starts, develops or ends. It is important not to have the story arcs sidetrack the campaign, unless you want a parallel feel. The X-Files TV show would often trade between the conspiracy plot and smaller episodic plots. That can work, but players often prefer to have plots weave together and feel connected. You also want to keep a small number of active plots. A good guideline is no more than three concurrent plot arcs – you can adjust this based on an understanding of the story and what the players and you can handle. It is usually ideal to hatch a plot arc early, develop it a bit later, and then focus on it and end it. You might have no sign of the escaped boy for many sessions, then he shows up in the crowd. A few sessions later he shows up as a helper in the arena and hints of others that he works with. Then you focus on his story and the group of which he is a part, closing out that story before working on any others. This gives a real sense of a living breathing campaign setting but does not overwhelm players with complexity. Next we take a look at the PCs. They are the stars of the show, right? This entry was posted on October 2, 2015 by Alphastream and tagged 4E, Authoring, Crown of Sorrow, Setting.